A bit longer than our regular beehive spit-curl with lovely face-framing wisps, this Bargain Doo Wop Wig is perfect for the '50's and '60's. 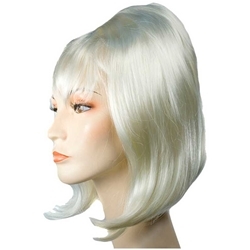 The Bargain Doo Wop wig is a great piece for Hairspray or the doo wop street singers in Little Shop of Horrors. The Bargain Doo Wop Wig is available in Brown, Blonde, Platinum Blonde, and Auburn.